Apple was on the center stage this month on the release of new smartphones, now it is Google’s turn. Google Pixel and Pixel XL, Google’s pure Android-based smartphones are set to debut October 4th. Google have started sending out invitations for an event in San Francisco where it is expected to introduce new smartphones and home automation hardware. Unlike its iconic Nexus series, which sometimes are designed by other company, Google is taking full control over the design of its phones. An example of such device with full control over its design is Google Chromebook Pixel and Pixel C which were all built by the search engine giant. Interestingly, Google has made available a site (madeby.google.com) through which customers can sign up to get more information about its newly produced device when it finally becomes available. Google’s Pixel branded phones won’t be the first Android 7.0 Nougat devices, but will be the first to support Google’s DayDream VR platform. From Australia to India, abstract statues and billboards have been taken over by Google ahead of its #madebygoogle event coming up in a couple of days. This move is in stark contrast to Nexus launches before, and Google could be setting its sights on iPhone’s hardware play. Apple’s latest iPhone 7 and iPhone 7 Plus are not a convincing upgrade anymore and with Samsung struggling with Galaxy Note 7, Google has a genuine chance to become a power player in the Android hardware space. According to a report out of Ausdroid, Google will start taking orders for the new Pixel smartphones, in Australia at least, on 20 October, with pre-orders to open on the day of the unveiling. There is no word on pricing for the Google Pixel and Pixel XL just yet. However, they are expected at a slightly higher pricing. Last year, Google had announced its flagship Nexus 6P at a starting price of $499 (about N160,000) and this time, the price could be significantly higher. Considering the Pixel branding in the past, it is likely that Google’s phones will bear a higher price tag. Who’s Designing Google Pixel and Pixel XL? The design stage of most flagship phones is usually shrouded in a level of secrecy and as expected, the manufacturer of the new Nexus devices, are not different. However, rumors have it that, HTC is Google’s choice this year. MyDrivers reported that HTC recently signed a three-year deal with Alphabet, Google’s parent company. Recent listings on the Global Certification Forum (GCF) also point to HTC’s involvement and confirms the existence of both a US and International version of the phones. Elsewhere, renowned tipster Evan Blass revealed codenames for the upcoming Pixel and Pixel XL devices: Marlin (M1) and Sailfish (S2) respectively. According to leaked renders, Google’s Pixel and Pixel XL smartphones will get dual tone design and feature metal and glass. The back of the devices is reported to feature a combination of metal and glass, which could become a first among smartphones. There is also fingerprint scanner on the rear like Nexus 6P and Nexus 5X. The front of the device is likely to be similar to HTC One A9. According to new images originating from a parts dealer in Hong Kong (below), published on Winfuture.de, the Pixel and Pixel XL display assembly were shown, along with the thinnest of bezels. Okay! They are what they are, rumors. Reddit user kalasipaee further used the snaps to mock-up a comparison (below) – here you can observe how the new phone fits into the existing Nexus lineup. In a report by Android Police, Google’s Pixel flagship phones will be taking on a decidedly cleaner design language. A “recreated” imagem (below), based on details from a mysterious source, of what the upcoming phones will look like, was published. Taking a second look at the rear camera, you will notice three holes which, according to rumors, could hide anything from laser focus, to mics or even a second sensor. There is a ‘G’ which suggest that a new branding is on it’s way, and a fingerprint scanner and antenna bands are also visible. A more closer look on the design feature was seen in a leaked image (below) made available by Android Authority. Beside the visible fingerprint scanner and antenna, the images showed a two-tone design with HTC 10-style antenna lines, USB Type-C port and, yep, a 3.5mm headphone port, unlike the newly-announced iPhone 7. 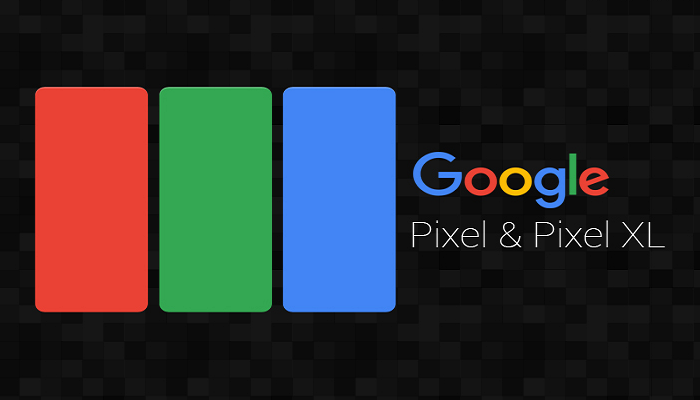 RUBIZTECH gathered that Google Pixel XL will be the flagship smartphone, while Pixel will be a mid-range offering. Google Pixel XL is reported to feature a 5.5-inch display while Pixel will boast of a 5-inch display. Both the smartphones are reportedly powered by Qualcomm’s latest Snapdragon 821 processor. The Pixel XL is reported to feature a Quad HD display while the Pixel will have to do away with a Full HD display. Like iPhone 7, Google’s phones will be available in 32GB and 128GB storage options but no 256GB option yet, though 4GB RAM is reported to be standard this time. As far as cameras are concerned, Google Pixel and Pixel XL will mostly feature HTC 10’s excellent 12MP rear camera with f/1.8 aperture and phase detection autofocus. The smartphone could also get 5MP front camera with OIS. Both devices could feature large batteries along with support for Daydream. The Pixel branded smartphones won’t be the first to run Android 7.0 Nougat, but rather feature Android 7.1 Nougat. Nougat will bring a host of new features, including a new split-screen mode, tougher security measures like file-based encryption, support for the Vulkan API, enhanced notifications, and Data Saver and Night modes. Android 7.0 (and up) will also support Google’s Android-powered Daydream virtual reality (VR) platform. Rumor has it that Google Pixel and Pixel XL will bring restart button and introduce ‘Pixel launcher’. Google’s Pixel launcher shrinks Google search bar into a G button like the one seen on Gboard keyboard on iOS. The app drawer will slide out from the bottom and replace the home button. The Pixel launcher will also allow users have five default apps on the basic app tray. Google could definitely introduce new software features at the event but expect Pixel launcher to be the top software bet this time. A separate report out of India Today claims the Pixel and Pixel XL will pack 2,770mAh and 3,450mAh batteries, respectively. The search giant has also posted a video online showing its horizontal search bar morphing into a phone outline with the tune of Redbone’s “Come and get your love” in the background.